Docking station, game app ® and auto return fuction. The Firefighter is a special of the Ahoy Series. 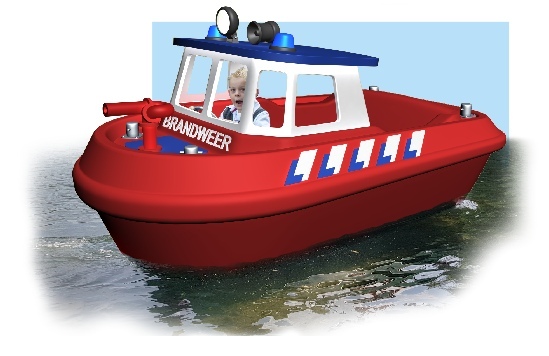 The Ahoy boats have a 24V waterjet engine for safe water propulsion and impuls steering for perfect stearing qualities. With its steering wheel in the front, this mini boat is designed for four children and their parent or grant-parent. The watercanon realy works, and can automatically switched off when it isn't near the 'fire' location - thanks to electronical science. The impuls steering is an worldwide innovation, this makes it possible to steer direct even if the boat moves slowly forward. And without any moving parts on the outside or rear of the boat. Ask us for a presentation of this product, so we can inform you about the details of easy charging, docking features and the special game app ®. The Ahoy Series are a dutch design.